It's a binder clamp, what can you say? It's well made, I've had several and none have fatigued in six or seven years. The lip on the top is a nice touch. They look beefy but are reasonably light. Be sure to order the correct diameter, not your seatpost diameter but the seat tube, don't ask why I brought that up. Comes in black and silver, I have one of each, they both look great. I use them on two different carbon Cervelo frames. Solid Performer and Low Profile Looks Good too. Looks nice, clamps the seatpost, does what I need. Has a slight lip (works as a stop) to make install easy. Well made, looks great and easy to use, how could it not be? Said it all above. Its a great piece of gear and works they way its supposed to with no issues whatsoever. replaced my normal pinch type seatpost collar on my mountain bike. 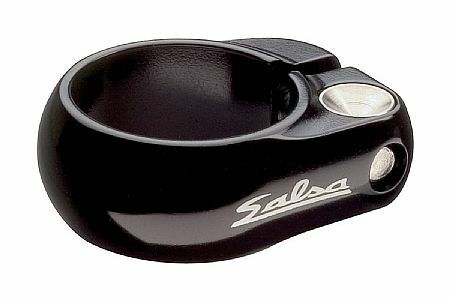 the Salsa Lip-lock does a better job with less strain on the bolt threads. Perfect fit. No more slip. Well machined part. This is just one of those things that you lump in to the cost of buying a new bike, along with a Thomson post and and whatever saddle you prefer to ride. Even top end bikes usually come with some glorified pipe clamp with a junk bolt threaded directly into low quality aluminum. Strippedloose seat binder tops the list of unlikely equipment failures that I hear from DNF'd racers all the time. Get your saddle where you want it and then KEEP IT THERE. The steel nut-insert in this makes it about infinity percent better than most stock binders and the bolt is a nice big hex size that you will never strip. It's like one gram heavier... do it.